Seeing is Not Believing - Hotspex, Inc.Seeing is Not Believing - Hotspex, Inc.
Across the five categories included in the study, there is a good correlation (.67) between attention as measured by laser eye tracking and Eyespex™ clicks, with some variability by category. Both methodologies show that respondents usually begin their exploration by focusing on the center of the shelf. Their attention then gravitates outward to other areas of the shelf. This validation study included a measure of market share based on virtual shopping: ‘products purchased on shelf’. 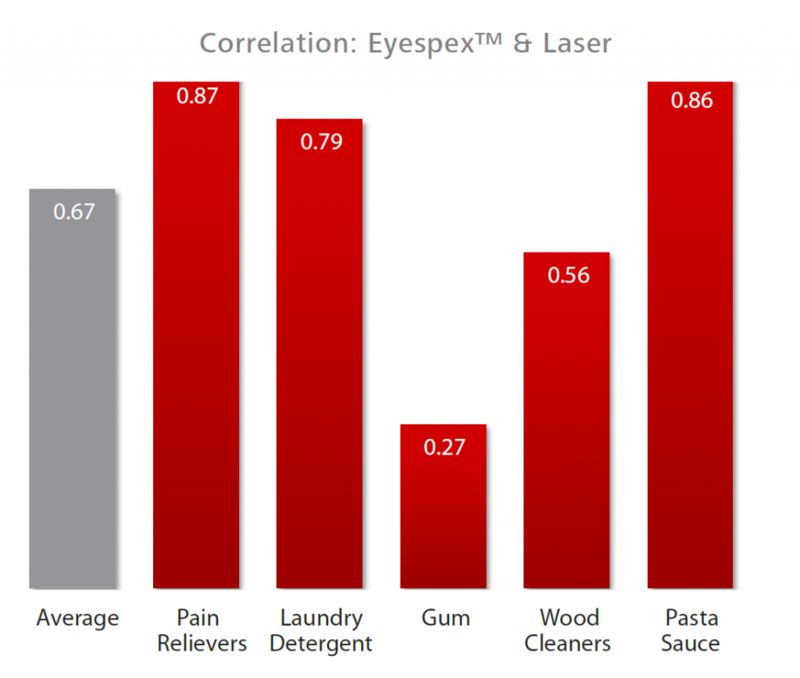 Eyespex™ is superior, correlating more closely than laser to products purchased on shelf in 4 out of the 5 categories, and is comparable with laser in the pasta sauce category. The underlying reason is that the physical act of ‘seeing’ a package on shelf is fundamentally different from the act of ‘clicking’, which involves mental processing of stimuli. This second scenario (clicking) more closely imitates the real-life shopping experience, which involves the same level of mental processing, because it culminates in a choice. The ‘seeing + thinking’ dynamic intrinsic to Eyespex™ is even more important when consumers are faced with highly-cluttered shelves. While shelf clutter and diversification were the most prevalent in the gum category in this study, retail shelves in general are becoming busier, forcing consumers to spend more time ‘processing’ before making a choice. Laser tracks physical eye movements, but the heart and mind do not always follow the eye. 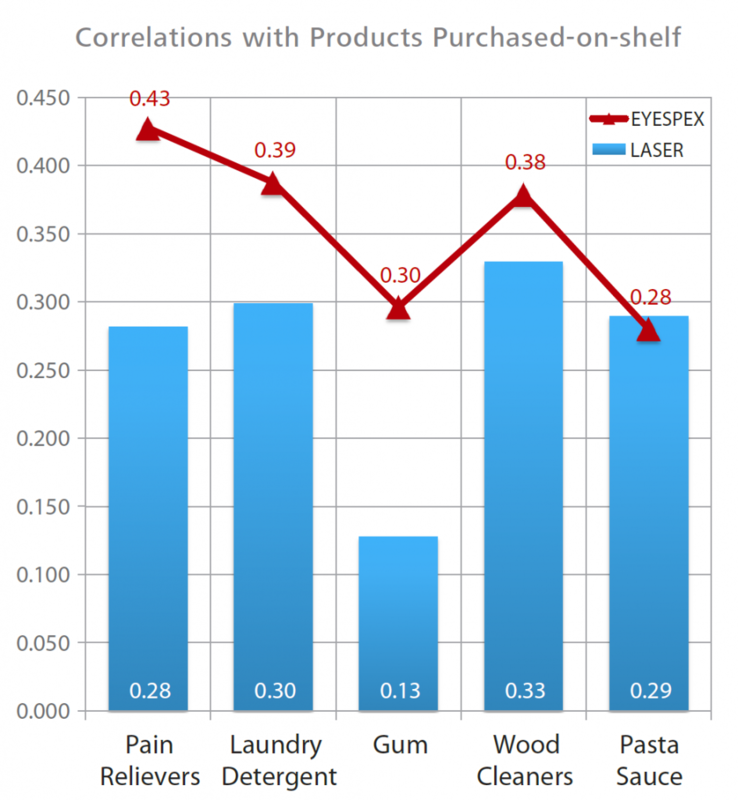 The relevance of these findings is underscored by the fact that our study observes a closer correlation between Eyespex™ data and purchased-on-shelf data than the correlation of laser to purchase data. 3. Disruptive truth: Eyespex™ is a better indicator of Market Share. a) What are the implications for online� packaging testing? 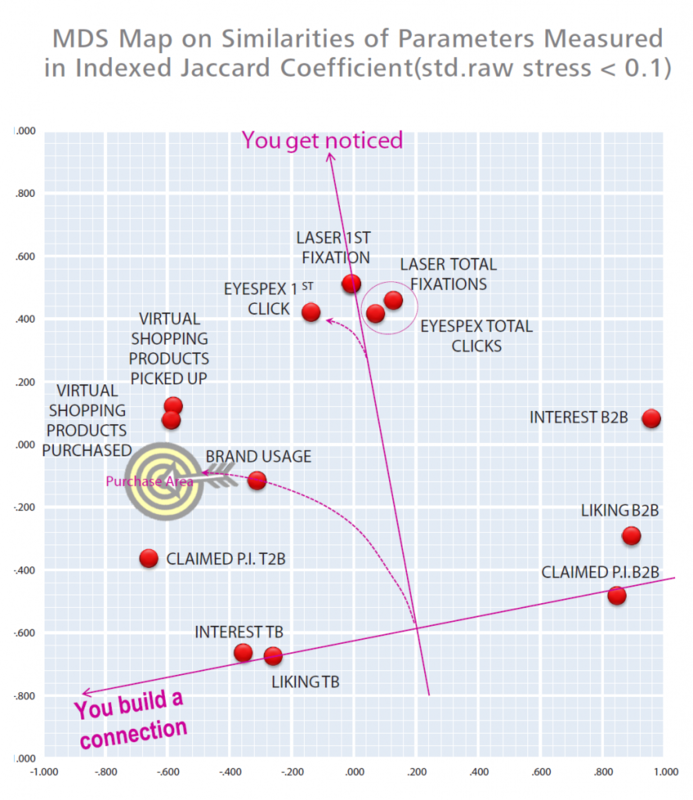 The purchase ‘sweet spot’ is where a package design achieves high scores on both claimed purchase intent as well as high rates of on-shelf purchase in the virtual shopping exercise. To get into this space, a package needs to be ‘noted’ (attention) and then be ‘processed’ (connection). Hotspex proprietary packaging testing methodology explores the ‘first moment of truth’ from both these vantage points and includes an industry-leading evaluation of the emotional relationship (as measured by Hotspex proprietary lexicons of 96 positive and negative emotional states and 182 positive and negative brand personality attributes), which accounts for at least 50% of consumer choice drivers according to a previous Hotspex R&D study. This underscores the importance of making a connection with the consumer at shelf in order to influence choice. Eyespex™ is inclusive of both attention and connection, meaning that respondents are more inclined to click first on what they like as opposed to what they first see, and it is clear that what they like is what they tend to buy. Technology has leveled the playing field for packaging testing methodologies with interactive technology, graphical power and global scalability. Online packaging design tests can be conducted in multiple countries with hundreds of consumers per design, providing a much more comprehensive evaluation of a design’s performance on-shelf (shelf test) and in isolation (concept test) in a fairly quick survey at a fraction of the price of in-facility testing. A total of 5 shelves were tested. The categories tested provided a good mix of package sizes, number of SKUs on shelf, category purchase cycle frequency, and repertoire vs. impulse categories: pain relief, laundry detergent, gum, wood cleaners, and pasta sauce. Per category, a total of n=75 interviews were conducted using laser eye-tracking (in-facility), and n=200 using Eyespex™ technology. Respondents were aged 18+ with quotas to ensure age distribution was proportionate to each category. 70% were female and 100% were New Jersey, USA residents for both in-facility (laser) and online Eyespex™ interviews. Other qualifiers included: primary grocery shopper or shared responsibility for shopping, recently purchased items from qualifying category, and standard industry exclusions. Traditional isn’t always better. Measure what matters. A pack is the essence of the brand – its role is to introduce, communicate, engage, reinforce and remind, as well as house the product. These many tasks are given to a relatively small space which needs to activate the target emotional states that drive consumer choice and relationship. The best packaging effectively balances these elements. The Hotspex packaging optimization methodology is designed to give due diligence to the various tasks that packages are asked to perform, depending on the competitive environment, and on the product’s life stage or strategic situation. This approach is both quantitative and highly diagnostic. While conventional marketing research companies were trading on outdated beliefs that skewed toward the rational, Hotspex was already alerting marketers to the ‘New Rules’. Six years of R&D led to revolutionary technology that measures the emotional impact of packaging on consumer choice. Our tools pinpoint with startling clarity where a package design needs to move the brand to activate target emotional states that drive consumer choice and relationship. Instead of taking consumers’ responses at face value, we harness the visual potential of the virtual world to give consumers a new visual language with which to respond and express their true emotions. Do you know whether it is time to change your packaging? If it is time to change it, are you leveraging both System 1 implicit measurement and aligning it to System 2 explicit measurement to truly understand what to say and convey to drive brand growth? Contact us to discuss the findings from this study or to learn more about our System 1 and System 2 packaging and distinctive brand assets audit. « Welcoming Dr. Dan Young, Ph.D.